Intergroup conflict contributes to human discrimination and violence, but persists because individuals make costly contributions to their group’s fighting capacity. Yet how group members effectively coordinate their contributions during intergroup conflict remains poorly understood. Here we examine the role of oxytocin for (the coordination of) contributions to group attack or defense in a multi-round, real-time feedback economic contest. In a double-blind placebo-controlled study with N=480 males in an Intergroup Attacker-Defender contest game, we found that oxytocin reduced contributions to attack and over time increased attacker’s within-group coordination of contributions. However, rather than becoming peaceful, attackers given oxytocin better tracked their rival’s historical defense and coordinated their contributions into well-timed and hence more profitable attacks. Our results reveal coordination of contributions as a critical component of successful attacks and subscribe to the possibility that oxytocin enables individuals to contribute to in-group efficiency and prosperity even when doing so implies outsiders are excluded or harmed. Conflict between groups is a recurring theme in human history. We tend to form social bonds with others who share the same characteristics as ourselves, whether that is nationality, ethnicity, or supporting the same football team. Individuals that belong to the same group as us comprise our ‘in-group’. All other individuals make up our ‘out-groups’. Competition and conflict with out-groups – from benign sporting rivalry to warfare – has a key role in shaping human cultures and societies. Such conflict often requires individuals to act in ways that harm their own self-interests. It also requires them to coordinate their actions with other members of their in-group. How does our biology drive this behavior? When small groups prepare for conflict with other groups, they often perform social bonding routines and rituals. These trigger the brain to release a hormone called oxytocin into the bloodstream. Known as the ‘love hormone’, oxytocin helps promote pair bonding as well as social bonding with in-group members. Studies in both humans and monkeys show that boosting oxytocin levels artificially via a nasal spray makes individuals more trusting and cooperative. But Zhang et al. now show that the ‘love hormone’ also helps individuals launch more coordinated ‘attacks’ on out-groups. In a study involving a multi-round economic contest game between groups of ‘attackers’ and ‘defenders’, oxytocin did not make attackers less aggressive. Instead it enabled them to better coordinate their attacks. Each contest game involved three attackers individually contributing money to a group pool to outbid the other group and win more money, and three defenders making similar contributions to their own group pool to defend it against the rivals’ attacks and protect themselves from losing all their money. Attackers who used an oxytocin nasal spray were better at tracking their rivals' defensive strategies than attackers whose nasal spray contained a placebo. Under the influence of oxytocin, the attackers timed their strikes to occur when their rivals were vulnerable. Over time, the oxytocin users became better at coordinating their behavior with other members of their in-group. This resulted in more earnings. Success – and even survival – in intergroup conflicts depends on how willing individuals are to make contributions that incur a personal cost. They also depend on how well individuals coordinate their contributions. Social strategies, such as leading by example, and neurobiological mechanisms such as oxytocin can both help achieve the coordination needed to exploit out-group rivals. Conflict between groups of people can profoundly change their demographic, economic and cultural outlook. Across human history, intergroup conflict functioned as a critical change agent and selection pressure that may have shaped the biological preparedness for in-group oriented cooperation and self-sacrifice on the one hand, and out-group hostility and aggression on the other hand (Bar-Tal et al., 2007; Boyd and Richerson, 1982; Choi and Bowles, 2007; De Dreu et al., 2010; Macfarlan et al., 2014). Out-group hostility and aggression serves to subordinate and exploit rivaling out-groups (henceforth out-group attack), and/or to defend the in-group against such hostility from neighboring groups (henceforth in-group defense) (De Dreu et al., 2016a; Halevy et al., 2008; Rusch, 2014a; Rusch, 2014b; Lopez, 2017; Wrangham, 2018). Recent work has showed that individuals are more strongly motivated to contribute to defend one’s own group than to attack out-groups and, importantly, that out-group attacks frequently fail because individual contributions to out-group attacks are poorly coordinated (De Dreu et al., 2016a). Indeed, attacking rivals who are expected to have strong defenses more likely results in failure and waste, than attacking groups expected to be weak and defenseless (De Dreu et al., 2016b; Grossman and Kim, 2002; Goeree et al., 2003). Thus, to succeed in intergroup competition and conflict, group members not only need to contribute to their group’s competitive strength, but they also need to coordinate within their group the intensity and timing of attacks. How group members coordinate behavior into effective joint actions during intergroup competition and conflict remains poorly understood (De Dreu et al., 2016a) and we lack insight into the underlying neurobiological mechanism. Here, we target the neuro-hormone oxytocin as a neurobiological mechanism underlying within-group coordination of out-group attack in dynamic intergroup contests. Studies in ethnography and anthropology have shown that small groups preparing for intergroup conflict build cohesion and commitment through social bonding routines and rituals. Groups selectively invite friends to join a raid (Glowacki et al., 2016), bond like family (Macfarlan et al., 2014), and engage in cultural rituals that simulate self-sacrifice, cooperation and coordination (Xygalatas et al., 2013). Neuroendocrine studies (Burkett et al., 2016; Carter, 2014; Ma et al., 2016b; Samuni et al., 2017) have linked these and related practices to the release of oxytocin, a nine-amino acid neuropeptide. In turn, intranasal administration of oxytocin has been shown to modulate neural responses in brain regions involved in threat detection and reward processing (Ma et al., 2016b; Paloyelis et al., 2016; Wang et al., 2017; Liu et al., 2019). Moreover, in both non-human and human primates, elevated levels of oxytocin via intranasal administration have been linked to a range of cognitive and behavioral effects including within-group conformity, trust, affiliation, and cooperation (Arueti et al., 2013; Aydogan et al., 2017; De Dreu et al., 2010; Madden and Clutton-Brock, 2011; Rilling et al., 2012; Samuni et al., 2017; Stallen et al., 2012; Yan et al., 2018). Whereas these work together point to oxytocin as a possible neurobiological mechanism underlying group coordination, three issues remain unclear. First, we lack empirical evidence for the possibility that oxytocin promotes group-level coordination of collective action in general, and during intergroup competition and conflict in particular. Second, we poorly understand how group members coordinate collective action during intergroup competition and conflict, and whether oxytocin can directly influence coordination and/or the strategy group members use to coordinate. Third, we do not know whether oxytocin differentially modulates tacit coordination within groups when collective contributions are focused on attacking one’s rival, versus defending the in-group against possible attacks by one’s rival. To address these issues, we examined the role of oxytocin in 80 interactive, multi-round contests between three-person attacker and three-person defender groups. Group members on each side made individual contributions to their group pool (aimed at attacking the other side, or at defending against such possible attacks). We provided individuals with real-time feedback on group investments and success after each contest round, which allowed group members to learn and adapt to their rival’s past investments, and use the history of play as a focal point to coordinate their future attacks and defenses. Indeed, when lacking explicit coordination mechanisms such as a leader or decision-making protocols (De Dreu et al., 2016a; Gavrilets and Fortunato, 2014; Hermalin, 1998), groups use social norms and focal points to tacitly coordinate collective action (Halevy and Chou, 2014; Schelling, 1960). In multi-round intergroup contests, the rival’s history of play can serve as a focal point for groups to coordinate their contributions to attack and/or defend (De Dreu et al., 2016b). Thus, when attacking out-groups, group members may coordinate their contributions on their rival’s historical level of defense, and attack when historical defense is low and the target appears vulnerable; and not attack when historical defense is high and the target appears strong and difficult to beat. We expected effects of oxytocin to be stronger during out-group attack than during in-group defense. In-group defense is first and foremost an adaptation to the attackers’ (past) aggression and is typically well-coordinated—individuals fight towards the same goal of self-preservation and group survival. Although there is some evidence that oxytocin may increase protective aggression (for a review see De Dreu and Kret, 2016), administering oxytocin may contribute little to the relatively high baseline levels of contribution and coordination during in-group defense. In contrast, out-group attacks are typically less strong, more variable, and less well-coordinated (De Dreu et al., 2016a), leaving more room for oxytocin administration to influence behavior. We anticipated two possibilities for the effect of oxytocin. On the one hand, oxytocin has been linked to prosociality (Madden and Clutton-Brock, 2011; Rilling et al., 2012; Liu et al., 2019), empathy (Hurlemann et al., 2010; Bartz et al., 2010) and consolation (Burkett et al., 2016). This line of research would lead us to anticipate that oxytocin may enable individuals in attacker groups to coordinate on a peaceful no-attack strategy that is independent of the rivals’ history of defense. On the other hand, oxytocin has been shown to enhance in-group conformity (Aydogan et al., 2017; Stallen et al., 2012; De Dreu and Kret, 2016), increase behavioral coordination and neural synchronization within pairs of individuals performing a joint task (Arueti et al., 2013; Mu et al., 2016), enhance facial mimicry, motor imitation, and neural responses linked to action-intention mirroring (Korb et al., 2016; De Coster et al., 2014; Kret and De Dreu, 2017; Levy et al., 2016), and improve memory and learning from feedback (Striepens et al., 2012; Guastella et al., 2008; Ma et al., 2016a). These functionalities alone and in combination may facilitate coordination on social norms and shared focal points that emerge during group interaction, suggesting that oxytocin may facilitate the use of rival’s history, enable individuals in attacker groups to coordinate better on the level and timing of their attacks, and to efficiently appropriate resources from their out-group. Evidence for this possibility would be consistent with earlier findings that oxytocin shifts the focus from self-interest to in-group interests (De Dreu and Kret, 2016), limits trust and cooperation to in-group members (De Dreu et al., 2010; Ma et al., 2015; Ten Velden et al., 2017), and promotes aggression toward threatening rivals (Madden and Clutton-Brock, 2011; Samuni et al., 2017; Striepens et al., 2012; Ne'eman et al., 2016). We examined these possibilities using a dynamic, fully incentivized Intergroup Attacker-Defender Contest game (De Dreu et al., 2016a). The IADC is an all-pay contest (Abbink et al., 2010; Dechenaux et al., 2015) involving six individuals randomly assigned to a three-person attacker and a three-person defender group. In the IADC game, 3 attackers made individual contributions to the group pool to subordinate the other group and increase gains through victory (but always keep the remaining resources), and 3 defenders contributed to their group pool to defend rival’s attack and protect against loss and defeat (defenders ‘survive’ from left with 0 only if defense succeeds). We created 80 IADC sessions (with N = 480 healthy males); in 40 (40) sessions, participants received intranasal oxytocin (matching placebo) (Figure 1). Each IADC session involved two blocks of 15 investment rounds with real-time feedback in between rounds. For each investment round (Table 1), each individual received an initial endowment of 20 MUs (Monetary Units). Each individual decided the amount (Ii, 0 ≤ Ii ≤ 20) to the group’s pool G (0 ≤ G ≤ 60, GAttacker = IAttacker-1 + IAttacker-2 + IAttacker-3, GDefender = IDefender-1 + IDefender-2 + IDefender-3). Contributions were wasted, but when GAttacker ≤ GDefender, attackers failed and defenders survived and all six individuals kept their remaining endowment (leftovers, 20 – Ii). However, when GAttacker > GDefender, defenders failed and left with 0. The attacker group won and took away defender group’s remaining MU (spoils from winning, 60 – GDefender), which were divided equally among three attacker group members (each attacker member received: (60 – GDefender)/3) and added to their remaining endowments (20 – IAttacker-i). Thus, contributions in the attacker group (GAttacker) and in the defender group (GDefender) reflect the contribution level to out-group attack and to in-group defense, respectively. In one 15-round block, individuals made their decisions individually and simultaneously without communication (i.e. Simultaneous decision-making block). In the other 15-round block (order counterbalanced), individuals within groups made their decisions in sequence: one randomly drawn member made his decision first, followed by the second randomly selected member who was informed about the first member’s contribution, and then the third and final member made his decision (i.e. Sequential decision-making block, De Dreu et al., 2016a; Gavrilets and Fortunato, 2014; Figure 2). Illustration of one round of the IADC game in the simultaneous and sequential decision-making blocks, respectively. Payoff matrix of one-round IADC. Table note: For each round, each individual received an initial endowment of 20 MUs (Monetary Units). Each individual decided the amount (Ii , 0 ≤ Ii ≤ 20) to the group’s pool G (0 ≤ G ≤ 60, GAttacker = IAttacker-1+IAttacker-2+IAttacker-3, GDefender = IDefender-1+IDefender-2+IDefender-3). When GAttacker ≤GDefender, attackers failed and defenders survived and all six individuals kept their remaining endowment (leftovers, 20 – Ii). When GAttacker >GDefender, defenders failed and left with 0. The attackers won and took away defenders’ remaining MU (spoils from winning, 60 – GDefender), which were divided equally among attacker group members (each attacker: (60 – GDefender)/3) and added to their remaining endowments (20 – IAttacker-i). The sequential decision-making protocol acts as a ‘coordination device’ that facilitates behavioral coordination within groups (De Dreu et al., 2016a; Gavrilets and Fortunato, 2014; Hermalin, 1998). This treatment thus provides a benchmark to compare groups in the simultaneous decision-protocol who lack an explicit coordination mechanism and have to find other means—such as a shared social norm or the rival’s past defense — to coordinate individual contributions into effective joint action (De Dreu et al., 2016a). We operationalized within-group coordination as behavioral alignment of contribution to the group, indicated by the variance in contributions to group fighting, with lower group-level variance reflecting better coordination. We expected that effects of oxytocin on group coordination would emerge especially under simultaneous rather than sequential decision-making. Before examining within-group coordination, we examined treatment effects on contributions to group pool. Individual contributions were averaged across the three members within each three-person group, and submitted to a 2 (Treatment: Oxytocin vs. Placebo) × 2 (Role: Attack vs. Defense) × 2 (Procedure: Simultaneous vs. Sequential) × 15 (Rounds) mixed-model Analysis of Variance (ANOVA) with Treatment between-sessions. Individuals contributed more under sequential than simultaneous decision-making (M ± SE = 6.89 ± 0.20 vs. 6.47 ± 0.24; F(1, 78) = 5.109, p = 0.027, η2 = 0.061), and somewhat less when given oxytocin rather than placebo (M ± SE = 6.28 ± 0.27 vs. 7.08 ± 0.30; F(1, 78) = 3.719, p = 0.057, η2 = 0.046; marginal significance). Figure 3A showed higher contributions to in-group defense than to out-group attack, especially in earlier rounds (Role, F(1, 78) = 287.903, p < 0.001; η2 = 0.787; Role × Round, F(14, 65) = 4.529, p < 0.001, η2 = 0.494). Oxytocin modulates contributions to group fighting. (A) Attackers contribute less than defenders, especially in early rounds (range 0–20). Curves were smoothed with a moving average window of three investment rounds. (B) Giving individuals oxytocin rather than placebo increases the number of non-contributing members in attacker groups especially under simultaneous decision-making (with 0–3 members per round across 15 rounds; range 0–45; displayed M ± 1 SE). Connectors indicate significant difference, with *p<0.05. Treatment effects also emerged when we examined the number of non-contributors. There were more non-contributors in attacker compared to defender groups (M ± SE = 20.23 ± 0.90 vs. 4.25 ± 0.44; F(1, 78) = 408.489, p < 0.001; η2 = 0.840), and more non-contributors in groups given oxytocin than placebo (M ± SE = 13.46 ± 0.90 vs. 11.01 ± 0.75; F(1,78) = 4.345, p = 0.040; η2 = 0.053). Crucially, oxytocin increased the number of non-contributors in attacker groups but not in defender groups (Role × Treatment, F(1, 78) = 5.043, p = 0.028, η2 = 0.061, Figure 3B). This Role × Treatment effect is especially true when decisions were made simultaneously (F(1, 78) = 5.712, p = 0.019, η2 = 0.068) but less so when decisions were made sequentially (F(1, 78) = 2.143, p = 0.147; η2 = 0.027). We then examined participants’ decision time when deciding to (not) contribute, we showed that individuals in attacker groups made their decisions to not contribute faster than to contribute (F(1, 78) =137.679, p < 0.001, η2 = 0.641). Oxytocin increased the speed with which individuals in attacker groups decided to not contribute (Treatment × Contribute: F(1, 77) = 4.857, p = 0.031; η2 = 0.059, Figure 4). Response time for decisions to (not) contribute. Oxytocin increased the speed with which attackers made their decisions to not contribute. Connectors indicate significant difference, with *p<0.05. Next, we analyzed group-level coordination operationalized as the within-group variance in contributions, with lower variance indicating stronger coordination (De Dreu et al., 2016a). First, there was a Procedure × Role interaction (F(1, 78) = 101.978, p < 0.001, η2 = 0.567) showing that sequential decision-protocol facilitated coordination for attack (F(1, 78) = 77.852, p < 0.001, η2 = 0.500) and, unexpectedly, reduced coordination for defense (F(1, 78) = 39.268, p < 0.001, η2 = 0.335). 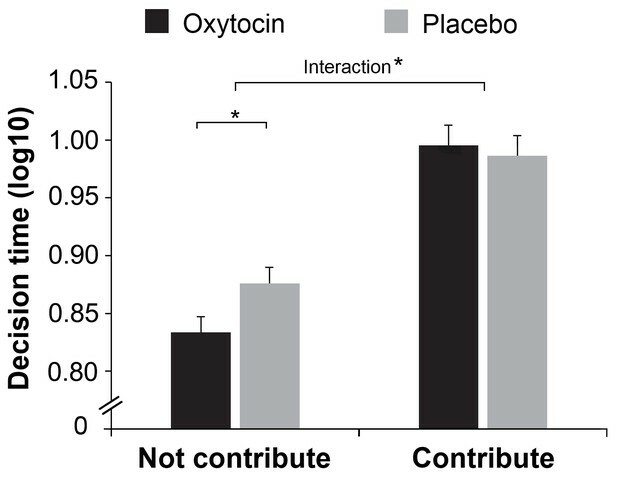 Importantly, as predicted, oxytocin facilitated group-level coordination (i.e. reduced within-group variance in contributions) of out-group attack but not of in-group defense, especially in earlier rounds (Role × Treatment × Round, F(14, 1092) = 1.753, p = 0.041, η2 = 0.022; Figure 5A; Figure 5—figure supplement 1 for similar results of another index of coordination). To examine what strategy attackers given oxytocin coordinated on, we first examined the contest outcomes. 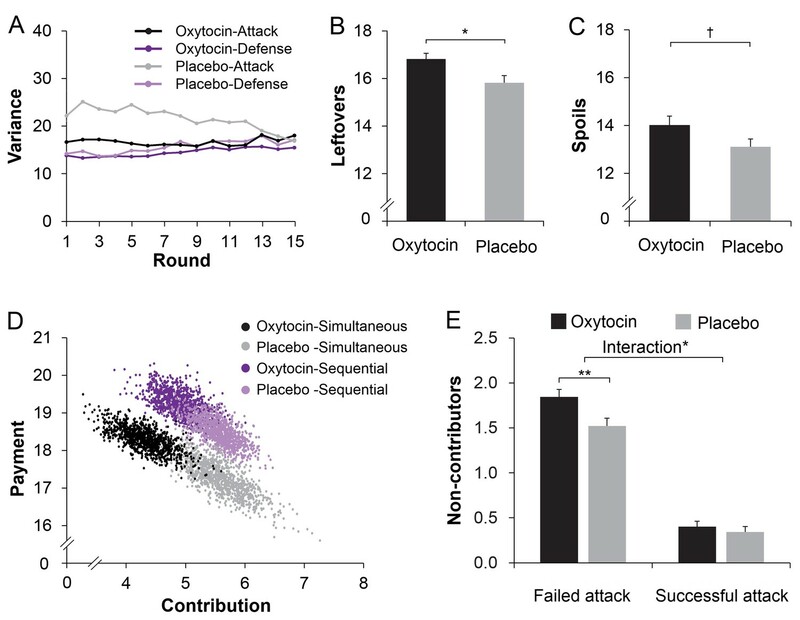 As noted, oxytocin may enable groups to coordinate on a peaceful ‘no-attack strategy’, in which case we should find (1) lower victories in attacker groups given oxytocin rather than placebo, (2) the oxytocin effect on the number of non-contributing attackers should not differ when attacks succeed or fail, and (3) no effect of oxytocin on tracking the rival’s defense history. This was not the case. First, the number of victories was similar in attacker groups given oxytocin (M ± SE: 24.8 ± 1.8%) and placebo (M ± SE: 26.6 ± 1.6%), (F(1, 78)=0.572, p=0.452; η2 = 0.007). Thus, rather than making groups coordinate on a peaceful no-attack strategy, oxytocin may enable groups to coordinate on attacking at the right moment with the right force. Indeed, analyses of the spoils and leftovers showed that groups given oxytocin rather than placebo had higher leftovers when attacks failed (t(78) = 2.609, p=0.011, Cohen’s d = 0.581, 95% Confidence Interval (CI), 0.232 to 1.76, Figure 5B) and somewhat higher spoils when attacks were successful (t(74) = 1.819, p=0.073, Cohen’s d = 0.419, 95% CI, −0.086 to 1.888, marginal significance, Figure 5C). To illustrate the increased efficiency of attack under oxytocin, attackers’ contribution and payment under the four conditions (i.e. Simultaneous/Sequential x Oxytocin/Placebo) were plotted in Figure 5D using a bootstrapping technique (Davison and Hinkley, 1977). Specifically, a bootstrapped dataset with sample size N = 40 was resampled with replacement separately for each of the four conditions. The mean contribution and payment of the bootstrapped sample was then calculated and saved as a new data point. For each condition, this procedure was repeated for 1000 times to represent the population information. As illustrated in Figure 5D, oxytocin decreased contributions to attack (a shift toward less contribution) but increased payment (a shift toward more payment). The distribution of attacker groups under oxytocin and placebo in a space defined by the two vectors (contribution and payment) indicates a clear separation of oxytocin and placebo treatments (especially when decisions were made simultaneously, that is black dots vs. grey dots). (A) Giving individuals oxytocin rather than placebo enables better coordination (lower within-group variance) in attacker groups, especially in early rounds. Curves were smoothed with a moving average window of three investment rounds. (B/C) Giving attackers oxytocin rather than placebo increases their leftovers when not winning the conflict (B) and spoils from winning conflicts (C) (N = 76 because four attacker groups never won). (D) Bootstrapping illustration of the oxytocin shifts on the contribution and payment. Bivariate distributions of 1000 bootstrapped sample means for each condition (Treatment x Procedure) plotted against the contribution and payment. (E) Oxytocin increased non-contributing attackers only in failed attacks but not in successful attacks. Connectors indicate significant difference, with † p < 0.10; *p < 0.05; **p < 0.01. Second, we conducted an ANOVA on the average number of non-contributing attackers, with Treatment (Oxytocin vs. Placebo) as a between-subjects factor, Procedure (Simultaneous vs. Sequential) and Success (Success vs. Failure) as within-subjects factors. There were more non-contributing attackers when attack failed than succeeded (Failure vs. Success: M ± SE = 1.68 ± 0.60 vs. 0.37 ± 0.05, F (1, 74) = 636.941, p < 0.001; η2 = 0.891). Interestingly, we found a significant Treatment × Success interaction on the number of non-contributing attackers (F (1, 74) = 6.345, p = 0.014; η2 = 0.075, Figure 5E): Oxytocin increased the number of non-contributing attackers only in failed rounds (Oxytocin vs. Placebo: M ± SE = 1.84 ± 0.09 vs. 1.52 ± 0.09; F (1, 74) = 7.036; p = 0.010; η2 = 0.083) but not in successful attacks (Oxytocin vs. Placebo: M ± SE = 0.34 ± 0.06 vs. 0.40 ± 0.06; F (1, 74) = 0.448; p = 0.505; η2 = 0.006). Third, we examined how attacker groups collectively identified when to attack by creating a past defense parameter α (average defender group’s investment in the last two rounds, that is (Dj-1+Dj-2)/2 on round j) and regressed attacker group’s investments onto α (attack increased when defender groups were vulnerable rather than strong, as indicated by α approaching -1). It showed that attacker groups given oxytocin tracked their rival’s past defense and attacked especially when defenders appeared more rather than less vulnerable (i.e. attack regressed negatively on rival’s historical defense). Specifically, when decisions were made simultaneously, attack regressed more strongly on α when groups received oxytocin (M ± SE: -0.30 ± 0.05) rather than placebo (M ± SE: -0.042 ± 0.098; t(78) = -2.334; p = 0.022, Cohen’s d = -0.522, 95% CI, -0.482 to -0.038), and under oxytocin but not placebo, the regression on α was also stronger in simultaneous rather than sequential decision-making (Treatment × Procedure interaction, F(1, 78) = 8.312, p = 0.005, η2 = 0.097, Figure 6A). Combined, results suggest that groups given oxytocin created more spoils from winning and had higher leftovers when attacks failed because they better coordinated attack at the right time and with the proper force. Indeed, when decisions were made simultaneously, the more strongly attacker groups relied on tracking parameter α, the lower their within-group variance when contributing (r = 0.281, p=0.012, Figure 6B), and the lower within-group variance when contributing, the higher the attacker’s spoils when winning the conflict (r = −0.328, p=0.004, Figure 6C). Indirect mediation analyses confirmed that the attacker’s higher spoils under oxytocin was mediated by (i) increased tracking of defender group’s past investments and (ii) concomitant increased within-group coordination (indirect effect = 0.147, SE = 0.103; 95% CI, 0.019 to 0.511, Figure 6D). Oxytocin enables a track-and-attack strategy (strength of attack increases when defender groups are vulnerable rather than strong, as indicated by α → −1). (A) When attacker groups are given oxytocin investments regress negatively on α (the rival’s historical investments to defense), especially during simultaneous than sequential decision-making. (B) Stronger negative regression of attack on rival’s defense history (α → −1) among attacker groups associates with better coordination (i.e. lower within-group variance). (C) Better coordination (i.e. lower within-group variance) associates with higher spoils when winning the conflict. (D) Oxytocin’s effect on spoils from successful attacks is mediated by treatment effects on tracking α (more strategic when α → −1) and better within-group coordination. † p < 0.10; * p < 0.05; ** p < 0.010). To be victorious in intergroup conflict, group members not only need to contribute to their group’s fighting capacity. They also need to coordinate collective action so that they attack when their rival is expected to be weak, and avoid wasting resources on attacking tough defenders. Here we found, using a dynamic intergroup contest between attackers and defenders, that those groups who tracked their defender’s history of play and coordinated their attacks of weak rather than strong defenders wasted less resources on failed attacks and enjoyed greater spoils when winning. In addition, we uncovered that oxytocin serves as a neurobiological mechanism underlying such well-timed and coordinated attacks. Specifically, we found that oxytocin enabled individuals within attacker groups to converge their individual contributions on each other more, to collectively refrain from attacking apparently strong defenders, and effectively attacking weak defenders. These findings emerged when groups lack an explicit coordination device; providing attacker groups with a sequential decision-making protocol as an explicit coordination device substituted oxytocin-induced tacit coordination. Our finding that oxytocin enables within-group coordination of contributions to out-group attacks resonates with two heretofore disconnected sets of findings—that small groups of warriors engage in social bonding and cultural rites (Glowacki et al., 2016; Macfarlan et al., 2014; Schelling, 1960; Wilson and Wilson, 2007; Xygalatas et al., 2013), and that social bonding and synchronized action can trigger the release of oxytocin (Burkett et al., 2016; Carter, 2014; Samuni et al., 2017). Combined with the current results, it suggests that oxytocin might be a potential neurobiological mechanism through which social bonding and performing coordinated rituals can help groups to better coordinate their attacks. Our findings furthermore suggest that such oxytocin-mediated within-group coordination can be substituted by institutional arrangements, such as a sequential decision-making protocol. We speculate that related institutional arrangements, like appointing a leader or having open communication channels can similarly obviate the need for bonding rituals and/or oxytocin to make out-group attack well-coordinated and successful. Neither oxytocin nor the sequential decision-protocol contributed to within-group coordination in defender groups. One possibility is that in-group defense is tacitly well-coordinated because of the stronger alignment of individual interests within defender groups. After all, when defender groups survive an enemy attack, those who did not contribute to in-group defense come out relatively wealthy. But when in-group defense fails, all group members lose regardless of whether they contributed or not. As a result of this stronger common fate in defender groups, individuals contribute spontaneously and tacitly coordinate well on avoiding collective defeat. Exogenous enhancers, whether at the neurobiological or institutional level, appear not necessary. Previous studies provided evidence for the role of oxytocin in intergroup interaction: It can increase the positive view and benign approach of the in-group and has been linked to subtle forms of intergroup discrimination (De Dreu et al., 2010; De Dreu and Kret, 2016; Ma et al., 2015; Stallen et al., 2012; Ten Velden et al., 2017). Without exception, this early evidence was limited to individual-level decision-making, and did not clearly distinguish the distinct motives for contributing to in-group efficiency and out-group hostility. It remained unknown whether and how oxytocin differentially affects attack and defense behavior during intergroup conflict. Using a dynamic attack-defense contest we revealed selective effects of oxytocin on group attacking. As such, the present study provides a new perspective on oxytocin in intergroup conflict by highlighting its functionality for strategic attack (rather than defense). In doing so, we also obtained first-time evidence that in-group coordination for collective action can be tracked to evolutionary preserved neurobiological factors. Our study has two potential limitations. First, it involved only Chinese males as study participants. Whereas we cannot exclude specific cultural effects, findings for the comparison between out-group attack and in-group defense and between sequential and simultaneous decision-making protocols resonate with findings obtained in Western culture, with both male and female participants (De Dreu et al., 2016a). This generates confidence in the generality of the behavioral effects for attack/defense and decision protocols. Furthermore, recent work on the role of oxytocin in in-group cooperation suggests similar effects for both male and female participants (Ten Velden et al., 2017). Thus, and given the absence of strong counter-evidence, we cautiously conclude that current findings may generalize across cultural contexts and apply to male as well as female participants. Second, it is unclear how exogenous administration of oxytocin operates at the neurophysiological level. Whereas some have questioned whether intranasal administration of oxytocin can have a direct impact on brain and behavior (Leng and Ludwig, 2016), recent studies in rodents (Neumann et al., 2013; Tanaka et al., 2018), rhesus macaques (Lee et al., 2018; Modi et al., 2014) and in humans (Paloyelis et al., 2016) collectively suggest that intranasal oxytocin elevates brain-level presence of oxytocin, and impacts behavioral decisions through neural networks involved in threat detection and reward processing (Carter, 2014; Hurlemann et al., 2010; Ma et al., 2016b; Rilling et al., 2012; Stallen et al., 2012; Wang et al., 2017; Liu et al., 2019). In addition, there is some evidence that higher levels of oxytocin in saliva, blood, or urine relate to in-group affiliation and cooperation (Madden and Clutton-Brock, 2011; Samuni et al., 2017) and intergroup discrimination (Levy et al., 2016). Nevertheless, new research is needed to uncover the neurophysiological pathways through which intranasal oxytocin impact human cognition and behavior, and how findings on intranasal oxytocin relate to endogenous oxytocin measured from saliva, urine, or blood samples. Intergroup competition and conflict shape the economic and cultural outlook of groups and societies, and interferes with individual life-trajectories. Success and survival in times of intergroup competition and conflict depend on the extent to which individuals make personally costly contributions and, as shown here, on their ability to coordinate their contributions when attacking out-groups, or defending against threatening out-groups. Both institutional arrangements, such as leading-by-example, and neurobiological mechanisms, such as oxytocin, facilitate behavioral coordination and the effective exploitation of out-group rivals. Indeed, as shown here, providing group members with oxytocin or an explicit coordination device enables them to waste less on failed attacks, and to earn more from their victories. We recruited 486 healthy males, mostly science and engineering students, as paid volunteers. One IADC session (N = 6) was dropped from data analysis because of technical failure. Data from 480 participants (80 IADC sessions, age 18–29 years; M ± SE = 20.28±0.09 years) were included in the final data analysis. The data analysis on the current study was conducted on a 6-person-group level, thus we conducted sample size estimation by G*Power to determine the number of groups sufficient to detect a reliable effect. Based on an estimated average small-to-medium effect size of oxytocin effect on social behaviors (d = 0.28, Walum et al., 2016), 80 6-person groups were needed to detect a significant effect (α = 0.05, β = 0.85, ANOVA: repeated measures, within-between interaction, G-Power, Faul et al., 2009). All participants were healthy and had normal or corrected-to-normal vision and no history of neurological or psychiatric disorders. Those who majored in psychology or economics or participated in any other drug study in recent weeks were excluded from participation. Participants were instructed to refrain from smoking or drinking (except water) for 2 hr before the experiment. The experiment involved no deception, and participants were paid for their presence for the experiment (i.e. $10 show-up fee) plus their average earnings in two randomly selected IADC rounds. All participants provided written informed consent to participate after the experimental procedures had been fully explained, and were acknowledged their right to withdraw at any time during the study. All experimental procedures adhered to the standards set by the Declaration of Helsinki and were approved by the Institutional Review Board at the State Key Laboratory of Cognitive Neuroscience and Learning, Beijing Normal University, Beijing, China (protocol number: ICBIR_A_0107_001). Participants were randomly assigned to the intranasal administration of oxytocin or placebo in a double-blind placebo-controlled between-subjects design (Figure 1). For each IADC session, six strangers were invited to the lab at the same time and randomly assigned to six individual cubicles within the same room. Upon arrival, participants first completed questionnaires that measured current mood, empathic capacity, prosocial personality, impulsiveness, subjective socio-economic status, and cooperative personality. Participants then self-administered oxytocin or placebo. After 35 min, participants were given instructions for the IADC game and completed two practice rounds. When they also passed a comprehension check, they played 15 simultaneous rounds and 15 sequential rounds of IADC investments (order of simultaneous and sequential blocks was counterbalanced across sessions, Figure 2). All the experimental instructions used neutral language (e.g. contribution was labeled investment; defense and attack were avoided, and groups were labeled as group A or B). Finally, participants filled out a post-survey for mood measurement and manipulation check. The attacker and defender groups under oxytocin or placebo did not differ in demographic information, mood change, and prosocial-related traits (Supplementary file 1, Table 1A and B). The procedure of oxytocin and placebo administration was similar to previous work that showed oxytocin effects on decision-making behaviors or in-group favoritism (De Dreu et al., 2010; Ma et al., 2015; Rilling et al., 2012; Yan et al., 2018). A single intranasal dose of 24 IU oxytocin or placebo (containing the active ingredients except for the neuropeptide) was self-administered by nasal spray about 35 min before the experimental task under experimenter supervision. A 24 IU dosage is the most commonly used dosage in oxytocin literature (Wang et al., 2017) and recently shown as having more pronounced effects (compared with 12 or 48 IU dose of oxytocin) on behavioral and neural responses (Spengler et al., 2017). The spray was administered to participants three times, and each administration consisted of one inhalation of 4 IU into each nostril. Six participants in the same IADC session were assigned to the same treatment (oxytocin or placebo), so as to avoid potential influence of oxytocin to placebo between individuals. Data were aggregated to the group level, with Role (Attacker vs. Defender), Procedure (Simultaneous vs. Sequential) and Round as within-group variables, and Treatment (Oxytocin vs. Placebo) as a between-group factor. Analyses were performed on (i) contribution (the averaged investment of each round, range: 0–20), (ii) the number of non-contributors (the number of group members making a 0 contribution across a 15-round block, range: 0–45), (iii) variance (within-group variance of each round), (iv) success rate for attack (range 0–100%), (v) the attackers’ leftovers when losing a conflict, (vi) the attackers’ spoils when winning a contest and, finally, (vii) inter-group tracking. The within-group variance is calculated for each decision round, thus reveals the group coordination of contribution at each round, with lower variance indicating stronger coordination. In addition, to complement and validate these analyses, we analyzed (viii) decision time for investment decisions (log 10-transformed decision time), and (ix) within-group coordination as reflected in the Intra-class correlation coefficient. The IADC is an all-pay contest with a single mixed-strategy Nash equilibrium (Abbink et al., 2010; Dechenaux et al., 2015). With two three-person groups, each member assumed to have risk-neutral preferences and having a discretionary resource of e = 20 MU to invest from, the IADC game has unique mixed-strategy Nash equilibrium with out-group attack (in-group defense) expected to average 10.15 (9.77)across rounds, and attackers (defenders) should win (survive) 32.45% (67.55%) of the contest rounds (De Dreu et al., 2016a). Across the 15 rounds of simultaneous decision-making under placebo, both out-group attack and in-group defense fell below the Nash-equilibrium (t(39) = −11.30, p < 0.001 and t(39) = −4.18, p < 0.001). Attackers defeated defenders in 22.08% (SE = 2.2%) of their attacks, which is below the Nash success-rate (t(39) = −4.734, p < 0.001). Oxytocin did not influence deviations from rationality (attack: t(39) = −15.78, p<0.001; defense: t(39) = −6.022, p<0.001; success-rate: t(39) = −6.615, p < 0.001). We showed that oxytocin increases the number of non-contributors in attacker groups. To further reveal how oxytocin influenced the non-contributing decisions, we examined participants’ decision time by calculating the response time separately for the round that participants decided to or not to contribute. This analysis was conducted only on the attacker group because (1) there were very few rounds (9%) in which defenders decided not to contribute; (2) oxytocin selectively influenced the number of non-contributors in attacker groups. Since the distribution of decision times is heavily right skewed, linear regression is not appropriate. Similar to our previous study (Ma et al., 2015), we first log 10-transformed decision times in all the analyses that involved decision times. The log 10-transformed decision time was submitted into a 2 (Contribute: Yes vs. No) × 2 (Treatment: Oxytocin vs. Placebo) ANOVA for the attacker group. The decisions of which the response time exceeded 180 seconds were excluded in final data analysis (0.51% of the decisions, due to network problem during the experiment). To complement and cross-validate the results for within-group variance as an indicator of within-group coordination, we computed another related index — the intra-class correlation. The intraclass correlation (ICC, De Dreu et al., 2016a; LeBreton and Senter, 2008) operates on a data structured as groups, rather than data structured as paired observations. ICC describes the amount of statistical interdependence within a group (group cohesion), reflects how strongly individuals’ contributions in all rounds in the same group resemble each other, that is how similar group members are in their contributions to the group pool across rounds. Higher ICC values in essence mean group members are more similar to each other in the contributions made to their group pool. A Treatment × Role × Procedure ANOVA showed effects for Role (F(1,78) = 43.090, p < 0.001, η2= 0.356), Procedure (F(1,78) = 166.199, p < 0.001, η2 = 0.681) and for the Role x Procedure interaction (F(1,78) = 147.586, p < 0.001, η2 = 0.654). Fitting the results for within-group variance reported in the Main Text (Figure 5A), results further showed that oxytocin increased attacker groups’ ICC under simultaneous decision-making (t(78) = 2.057, p = 0.043, Cohen’s d = 0.460, Figure 5—figure supplement 1; not under sequential block: t(78) = -0.179, p = 0.859, Cohen’s d = 0.040), but did not influence defender groups’ ICC (simultaneous: t(78) = 0.485, p = 0.629, Cohen’s d = 0.108; sequential: t(78) = 0.389, p = 0.698, Cohen’s d = 0.087). To test whether attacker groups made their contributions based on tracking of their rival’s historical level of defense, we built a multiple linear regression of attacker groups’ average contribution on round j (referred as Aj, with j range from 3 to 15) as a function of average level of defense of last rounds (calculated as (Dj-1 +Djj-2)/2, regression weight referred as α). The regression weight α was Fisher’s z transformed for statistical analysis. Similar to a previous study (De Dreu et al., 2016b), we also included another parameter: defense change of the last and before-last rounds, calculated as (Dj-1 - Dj-2), regression weight referred as β. However, the analysis on β failed to show significant main effects of Treatment/Procedure or their interaction (ps >0.1). To complement the analysis of attacker groups, we also examined whether and how defender groups tracked the historical level of attack in their rivals. This showed that defender groups relied more on α to track attacker groups under simultaneous (relative to sequential) decision-making. The main effect of Treatment and its interaction with Procedure were not significant (ps >0.05). In these models, X is the independent variable (Treatment, dummy-coded, 0 for placebo and one for oxytocin), M1 is the first mediator (the weight for attacker group’s tracking of the historical defense, the tracking coefficient, α), M2 is a second mediator (attacker group’s within-group variance), and Y is the dependent variable (attacker groups’ spoils from winning a conflict, reported in the Main Text, and DV with the sum of attacker groups’ spoils from winning a conflict and leftovers from losing a conflict reported in the SI). A resampling method known as bootstrapping was used to test the direct and indirect path. Bootstrapping is a nonparametric approach to effect-size estimation and hypothesis testing that is increasingly recommended for many types of analyses, including mediation (Mackinnon et al., 2004; Shrout and Bolger, 2002). Rather than imposing questionable distributional assumptions, bootstrapping generates an empirical approximation of the sampling distribution of a statistic by repeated random resampling from the available data, and uses this distribution to calculate p-values and construct confidence intervals (5000 resamples were taken for these analyses). Moreover, this procedure supplies superior CIs that are bias-corrected and accelerated (Preacher et al., 2007). Results are summarized in Figure 6D, Figure 6—figure supplement 1, Supplementary file 1, Table 1C and D. As can be seen, multistep mediational analysis showed that the oxytocin effect on increasing attacker group’s spoils from winning the conflict plus leftovers from losing the conflict was mediated by its effect on increasing tracking of defenders’ history so as to increase within-group coordination. Journal of Cognitive Neuroscience 25:1418–1427. Journal of Social Issues 63:441–460. Annual Review of Psychology 65:17–39. Social Cognitive and Affective Neuroscience 11:1236–1244. Games and Economic Behavior 45:97–113. Journal of Economic Growth 158:393–407. Journal of Personality and Social Psychology 106:398–417. The American Economic Review 88:1188–1206. Proceedings of the Royal Society B: Biological Sciences 284:20162554. Trends in Cognitive Sciences 20:133–145. Proceedings of the National Academy of Sciences 111:16662–16669. Proceedings of the Royal Society B: Biological Sciences 278:1189–1194. Social Cognitive and Affective Neuroscience 11:1882–1893. Proceedings of the Royal Society B: Biological Sciences 281:20141539. Social Cognitive and Affective Neuroscience 12:1565–1573. The Quarterly Review of Biology 82:327–348. Thank you for submitting your article "Oxytocin promotes synchronized out-group attack during intergroup conflict in humans" for consideration by eLife. Your article has been reviewed by four peer reviewers, including Peggy Mason as the Reviewing Editor and Reviewer #1, and the evaluation has been overseen by Timothy Behrens as the Senior Editor. The following individuals involved in review of your submission have also agreed to reveal their identity: Caroline F Zink (Reviewer #2); Takefumi Kikusui (Reviewer #3). The reviewers agreed on the value of the data generated in this study. The sample size is large and well controlled. There were concerns around clarity of methods and results that the authors may want to consider to most efficaciously reach the widest audience. There were also two primary areas where the reviewers would urge the authors to either adjust their interpretation or at least acknowledge the possibility of other interpretations. Playing a monetary computer game is not dancing together to go to war. The behavioral–motor synchrony is simply not at play here. This analogy should be dialed back. More fundamental to the point the authors purport to make are simpler explanations for the results than attack coordination. For example, it could be "that a primary role of oxytocin [is] to increase one's own (at an individual level) social intuition and acuity in the assessment of how strong or challenging a defense may be and when and how it would be effective to attack as a result (along the lines of social adaptation)" (Reviewer #2) or that "oxytocin increased the participants' memory for the sequence of events (there is evidence for oxytocin effects on memory) or that it reduced their level of stress and increased calmness and lethargy (there evidence in both humans and animals) and they reduced their contributions" (Reviewer #4). We look forward to seeing this exciting contribution to our understanding of OXT and its effects on behavior. Your findings are more nuanced than the extreme version favored by the public and curiously still adopted by many scientists even beyond those heavily invested in the OXT-as-positive social modulator view. Thank you for communicating this work to us. Overall this is an exciting contribution to our understanding of OXT and its effects on behavior with a result that is more nuanced than the extreme version favored by the public and curiously still adopted by many scientists even beyond those heavily invested in the OXT-as-positive social modulator view. Beyond the rhetorical issues detailed in Minor comments, my major concern is that the authors use motor and social terms for what is an in silico experiment. Participants never did anything active beyond pressing a computer key. To compare in silico coordination to a "war dance" misses the criticality of movement and motor mimicry, which do not play a role here. It is in my opinion even a bit of hyperbole or slight of hand to rely so heavily on the motor-laden words of attack and defend. This is really some economic version of hostile takeover/ investment. The actions have no inherent meaning and the motor system does not come directly into play. I would ask that the authors tone down the motoric rhetoric. Evolutionary ancient is a poor term (what does it even mean? )- I believe that phylogenetically widespread or conserved would be a more scholarly way to put it. The distribution of intranasal OXT is controversial and the statement in the second paragraph of the Introduction should be toned down. Most of the refs cited have nothing to do with distribution (eg Burkett is on effects of OXT on prairie vole behavior) and for example the Paloyelis paper discusses changes in blood flow that may be direct but just as easily could be the indirect result of OXT actions. That the jury is out regarding where OXT works with what time course is okay to acknowledge. Please don't overstate the case. Figure 2 is confusing. in the simultaneous block, why would the attackers get 17 when they lost 7 to 6? By your description, Results paragraph one, they should hold onto 14 rather than "earn 17." Then in the sequential rounds, why is the last one 18 instead of 16? And really – why would you choose a fraction? When the attackers win 10-7, the win (spoils) is (60-7)/3 = 17.8 rounded down to 17 and that is before adding to their remaining MU? But instead it is 16, 16, and 18. Spell it out please or fix the description in the Materials and methods. Something is not right. Why use both correlation and variance? And why not just use SD? Explain the bootstrapping. This is a general audience. Make it understandable to the general scientific reader. Materials and methods subsection “Procedure”; Several of the mood measures did change (Supplementary file 1) and in a highly interesting way. Why is it stated that none changed? This fascinating investigation of oxytocin (OT) in intergroup conflict is interesting, important, and timely. It is creative and innovative with regards to the paradigm, analyses, and interpretations. In addition to innovation, additional strengths include a large sample size for adequate power, and breadth of analyses performed. I did notice that some of the most important statistical tests for the conclusions were not significant, but rather statistically trending (Results section) which in my opinion should be noted/discussed as such. I am curious how the subjects were paid. Was their final payment associated with their performance in the task? What is the interpretation of OT increasing the number of non-contributors during attack? The data supporting the notion that OT does not increase contributions to attack in general, but rather coordinates attacking at the right moment with the right force is quite compelling, especially being more pronounced in the simultaneous rather than sequential procedure. To make that point explicitly in terms of oxytocin increasing payment (leftovers and spoils) more during the simultaneous procedure, it would be nice to see the analyses pertaining to that broken down by procedure (i.e. simultaneous and sequential separately). Without debating semantics, which is not my intention, I am also struck by the interpretation that OT is a biological mechanism to converge or "coordinate" contributions between individuals in the attack group (when not sequential). It seems to me that the concept of coordination or convergence is secondary to perhaps a primary role of oxytocin to increase one's own (at an individual level) social intuition and acuity in the assessment of how strong or challenging a defense may be and when and how it would be effective to attack as a result (along the lines of social adaptation). In the simultaneous context, it would be evolutionarily important for each individual to act at maximum efficiency because there is no leader or others to rely on as there is in the sequential procedure. So by OT increasing each individuals' social acuity and using that information to act most adaptively or effectively, as a group they will appear coordinated (acting similarly) in their beneficial action and together will achieve success. In this case, OT would not be facilitating the social coordination per se, but rather individual social acuity and reaction assessment that is necessary to achieve success as a group in the simultaneous context. Also, I am not convinced that this study demonstrated that social bonding and performing synchronization rituals helps coordinate attacks (as put forth in paragraph two of the Discussion) because as I understand it, in this study group members did not interact or socially bond before coordinating their attacks. Overall, I was extremely impressed with the caliber of this thought-provoking manuscript and believe that is positively contributes to the field and scientific community. Many of the figures legends are lacking definitions of the symbols used to denote significance (i.e. what significance level). Also the key is missing in Figure 5—figure supplement 1. Discussion, third paragraph final sentence: should it be *not* needed? Discussion paragraph four: "remains" should be *remained* past tense because it does not remain with the current study. This paper demonstrated that in an inter-group conflict game, exogenous oxytocin (OT) treatment increased attacker's within-group synchronization of contributions (reduced within-group variance). These behavioral changes would be because of selecting more effective strategy (attacking at a proper time when the defender was weak). This within-group coordination in attacking can increase spoils from winning. The aim of this study was based on their previous studies and was clear, and the methods were well-conducted. The number of the participants were well-enough to draw the conclusions. However, I have some concerns/questions on this form of the manuscript. 1) In Figure 1A, the authors mentioned that contribution amount was low in the subjects in the OT Condition. However, the authors already reported that OT promotes internal group defense (as a review De Dreu and Kret 2016 https://www.ncbi.nlm.nih.gov/pubmed/25908497). Therefore, it is necessary to present the data comparing Contribution amounts among four levels (Treatment × Role). If there was inconsistency between their previous study and present results regarding to the effects of OT on contribution in defense group, the authors need to discuss this. 2) In Figure 1B, the data were inconsistent with De Dreu et al., 2016, in that there is no difference in the frequency of Non-contributors between Simultaneous and Sequential. The authors need to explain the inconsistency. 3) In the same figure, in the Attack group of the Simultaneous and OT condition, did the frequency of Non-contributors increase in rounds in which attacks fail, and did the frequency of Non-contributors decrease when the attack succeeded? The information on the frequency of non-contributors when dividing by attacking success / failure is necessary. 4) If OT changes the attack efficiency, it is thought that information on how the defense parameter α has a negative regression coefficient to influence the success rate of attack is necessary. 5) In Discussion, the authors discussed one possibility that in-group defense was tacitly well-coordinated because of the stronger alignment of individual interests within defender groups. If this is true, would the results change by modulating the ratio of losing/gaining MU as the results of attach/defense? How did the authors decide the ratio of cost/benefit of the MU after the challenge? In this study, the authors examined the effects of oxytocin administration on a large sample of Chinese men (n = 480) engaged in a three-person monitory game divided to "attackers" and "defenders" where the goal was to evaluate donation to the group monetary pool in relation to the donation of own group and opponent group. It was found that oxytocin reduced donation to the group pool in the "attacker" group and increased the "coordination" between the participants' donation, defined as the inter-subject correlation between the parents' contribution. It also increased the "attackers" ability to track the opponents' contribution in sequential trials. The large sample size is an asset of the study. It is, to my knowledge, the largest oxytocin administration study conducted so far. The game is complex and so are the statistical analyses. The major issue with the study, in my opinion, is whether it measures what it claims to show. 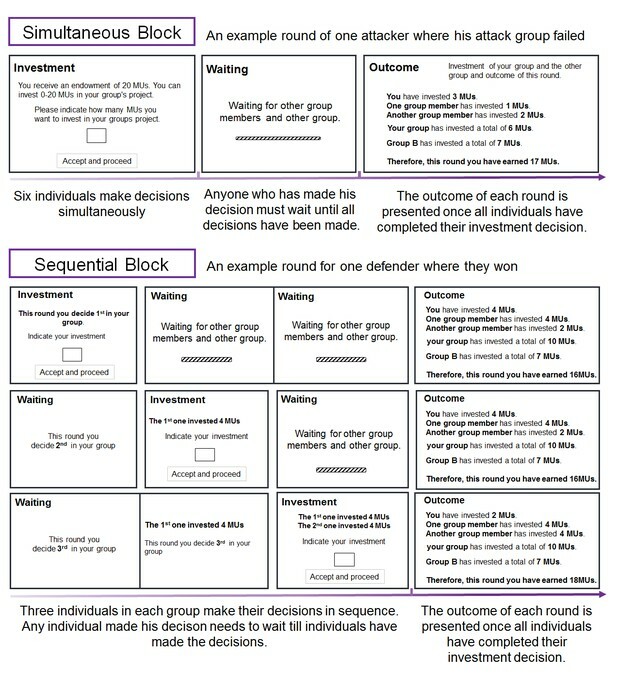 It is unclear whether the economical game the authors developed can provide any simulation to real-life battle, "warrior games" or "coordinated action" (the theoretical frame they set for the study), whether inter-subject correlations between monetary contributions of individuals and reduced variance indeed show "group synchrony" in the face of external danger, whether survival has anything to do with the neurobiological processes that underpin this game, and whether there are alternative explanations to the findings that are more plausible and parsimonious (and more consistent with findings from studies on oxytocin administration and economical games). In terms of "coordinated action" or "behavioral synchrony" among groups, the increased group cohesion in the face of danger, and the rites and rituals group perform before going to battle, these are indeed very powerful mechanisms and are found across human cultures and non-human primates. What is unclear is how coordinated action patterns relate to contributing more or less to the general pool in a sequential economic game. There are ways to measure action coordination in groups, in terms of real action patterns, mimicry, imitation, facial expressions, coordinated movement etc, and the increase in coordination results from various factors in the group, for instance, the presence of a charismatic leader (Gordon, I. Berson, Y. Oxytocin modulates charismatic influence in groups. J Exp Psychol Gen. 2018 Jan;147(1):132-138. doi: 10.1037/xge0000375). It is unclear at all why the authors measure "behavioral synchrony" as the reduced variance among the contributions of members and it is not possible, in my opinion, to simply link this reduced variable to the literature on behavioral synchrony, action coordination, and war rituals without some kind of validation that this reduced variance in the differences of contribution over trials is indeed related to more behavioral coordination. Without such indication, it is not possible to propose that oxytocin, which is indeed a mechanism to enhance coordination of behavior (movements, vocalizations, mimicry) in humans and non-human primates, to the present findings. An additional difficulty is the claim that literature on survival is relevant to this game in any way and that playing this game simulates mechanisms of survival. Here, I was unclear about the difference between "attackers" and "defenders" on a biological level. It appears that one group was told that they "attack" something and another that they "defend" something but attack and defend where not part of the ongoing game, even not at the level of a simple board game where there is a simulation of "defending a castle", but that the real game, for the two groups, was identical was about how to outsmart the other group in terms of donating more or less. The distance between this and proposing that the two groups differ on biological mechanisms is substantial, and must be demonstrated prior to conducting this study. It is more parsimonious (and plausible) to conclude that the mechanisms underpinning this game related more to human competition and are supported by humans' large prefrontal abilities, working memory, and far-sighted planning, and are unrelated to "movement coordination" in the face of a threat to survival. Such mechanisms are likely to be identical for the attackers and defenders (unless otherwise proven) and probably have much less to do with more primitive mechanisms described in the animal literature. For instance, the primate study the authors cite (Summani) showed greater vocal coordination and greater urinary oxytocin in primates during live conflict and is too great a leap to hypothesize from this to reduced variance of donation among players in a safe room. This study also did not differentiate between the behavioral repertoire (and oxytocin production) of attack (where motion and vocal synchrony correlated with oxytocin) and those related to "border patrol", which suggests that in the animal kingdom, both attack and defense are part of the survival and may not be biologically distinct. The inter-subject correlation – the authors' index for behavioral synchrony – was measured only in the "attacker" group (rationale not clear) but this group also markedly reduced its contribution over time under oxytocin. It is possible that the increase in correlation among group members resulted from that decrease and that the zero donation correlated among the participants (even if we accept the suggestion that this is a proxy for synchrony, it is a synchrony of "no action" rather than of action). A more parsimonious explanation for the findings – and one that must be ruled out before offering a mechanistic explanation based on rituals and action coordination – would be that oxytocin increased the participants' memory for the sequence of events (there is evidence for oxytocin effects on memory) or that it reduced their level of stress and increased calmness and lethargy (there evidence in both humans and animals) and they reduced their contributions. Even within the literature on oxytocin and economic games (which should provide the conceptual frame for this study) the findings need to be reconciled with those showing that individuals donate more under oxytocin. Is this a cultural phenomenon specific to the Chinese culture? Another important issue is the between-subject design, which is not the golden standard in oxytocin administration research. Particularly in relation to economic games, a recent study showed different brain activation patterns in a within- and between-subject design in an OT administration study using the prisoner's dilemma (Chen X, Gautam P, Haroon E, Rilling JK Within vs. between-subject effects of intranasal oxytocin on the neural response to cooperative and non-cooperative social interactions. Psychoneuroendocrinology. 2017 78:22-30. doi: 10.1016/j.psyneuen. 2017.01.006). At least, the authors should describe how randomization was conducted and show extensive comparisons among groups not only in demographics but also in relevant physiological variables (for instance, BMI). In sum, the authors have collected an impressive sample and the study is complex and well-analyzed. The conceptual frame should fit the study design and alternative explanation must be carefully considered before contribution of the findings can be considered. As frames, the conclusions of the study are not supported by the data and design and may be misleading. No need for more data. The study does not measure behavioral synchrony under conflict and there is a great gap between measuring the degree of sameness in how much individuals contributed (or didn’t contribute) and the survival evolutionary frame, war rituals, and action coordination the authors invoke to support the findings. In the current frame and design, the conclusions are misleading. Playing a monetary computer game is not dancing together to go to war. The behavioral – motor synchrony is simply not at play here. This analogy should be dialed back. We appreciate these helpful suggestions. Accordingly, our revision stays closer to the data and removes any language that refers to behavioral-motor synchrony. For example, the reference to behavioral synchronization was replaced by coordination of investment or coordinated contribution; intergroup conflict was replaced by intergroup competition and conflict. We also noted and/or discussed other possibilities to interpret the current finding, as suggested by the reviewers #2 and #4 in the revised manuscript. We’re grateful to the reviewer for this helpful suggestion. We agree with the reviewer and take care of our language to avoid the link to movement or motor action. For example, we omitted the term behavioral synchronization and deleted the ‘war dance’ metaphor. We did keep, however, the terms ‘attack/attacker’ and ‘defense/defender’ in the revision for two reasons. First, we use these terms to keep consistency with the literature as these terms were used in the original economic game (De Dreu et al., 2016; in press). Second, we used the terms ‘attack/attacker’ and ‘defense/defender’ to indicate that the two parties in the current economic game are in different positions (an asymmetric structure of attacker and defender), with one side aiming to increase gains through victory (but always keep the remaining resources), and the other side aiming to protect against loss and defeat (i.e., they keep their remaining resources only when defense succeed; otherwise they are left with 0). In the revision, we explicitly stated that the terms ‘attack/attacker’ and ‘defense/defender’ were used in the context of economic games to avoid the link to movement or motor action. Moreover, we included specific definitions of out-group attack and in-group defense (Introduction and Results section). We thank reviewer #1 for pointing this out and we revised accordingly throughout the manuscript. We do agree with reviewer #1 that the pathway intranasal oxytocin takes to the central system is unclear and controversial. In the revised manuscript we have tried to be more nuanced. For example, we now refer to studies showing evidence that intranasal oxytocin modulates neural responses in brain regions involved in threat detection and reward processing without making claims about the mediating neurophysiological pathways (Introduction paragraph two). We thank reviewer #1 for pointing this out, and we have accordingly revised Figure 1. We apologize for not being clear and revised Figure 2 accordingly. Moreover, we added a table to provide a clear description of the rule for the IADC game, as well as how the payment is calculated for each individual (i.e., Table 1 in the revision). Regarding the specific examples in Figure 2: in the simultaneous block, we illustrated one round for an attacker group who lose this round (investing 6 in total vs. a defender group’s pool of 7) leaving each attacker with what was left from their contribution: Attacker 1 earned 17 (as 20-3), Attacker 2 earned 19 (as 20-1), and Attacker 3 earned 18 (as 20-2). In the sequential block, we illustrated one round for a defender group who win this round (investing 10 in total vs. an attacker group’s pool of 7) thus leaving each defender with what was left from their contribution: Defender1 earned 16 (as 20-4), Defender 2 earned 16 (as 20-4), and Defender 3 earned 18 (as 20-2). We thank reviewer #1 for raising these questions, thus giving us the opportunity to clarify these measures in the current study (Results paragraph two; Materials and methods subsections “Data analysis” and “Within-Group Coordination”). We used the correlation coefficient (intraclass correlation coefficient, ICC) and variance to indicate different aspects of the group-level coordination (contribution similarity of members of the same group), with the correlation coefficient reflecting group decision similarity across all rounds and variance reflecting the differences between each group member and the group mean on a round-by-round basis. The ICC (LeBreton and Senter, 2008) operates on a data structured as groups, rather than data structured as paired observations. ICC describes the amount of statistical interdependence within a group (group cohesion), reflects how strongly individuals’ contributions in all rounds in the same group resemble each other, i.e., how similar group members are in their contributions to the group pool across rounds. Higher ICC values in essence mean group members are more similar to each other in the contributions made to their group pool. On the other hand, the within-group variance is calculated for each decision round, thus reveals the group coordination of contribution for each round, with lower variance indicating stronger coordination. Thus we can examine the effects of Role, Procedure and Treatment on group variance, as well as to reveal how these effects on group coordination change across rounds. For both indices, we observed a similar pattern that oxytocin increased within-group coordination in attackers especially when decisions were made simultaneously. Thus, we reported the effect on within-group variance in the main text, and reported the similar effect on ICC in the SI as a further support. The standard deviation can be calculated out of variance, as the square root of the variance. The results would be the same. We chose to use variance to keep consistency with the literature (De Dreu et al., 2016; 2019). We thank the reviewer for this suggestion, accordingly we provided a clearer description of how the bootstrapping is done (Results paragraph six). We checked the mood measures in Supplementary file 1, Supplementary Table 1B again but confirmed that no Treatment x Role interactions on mood change was found (not for the positive and negative mood separately, nor for the overall mood change). We realize that the presentation of both F and p values might be confusing to the audience, thus we only included the Mean (SE) and p-values in the revised Supplementary file 1. Supplementary Tables 1B. We conducted the paired t-test (before- vs. after-experiment mood) for each group to examine mood change for each group. None of the group showed significant change in positive mood or negative mood (ps > 0.05). Moreover, ANOVAs with Treatment and Role as between-subjects factors on the positive, negative, and overall mood changes also did not show significant main effects of Treatment and Role, or Treatment x Role interaction (ps > 0.05). This fascinating investigation of oxytocin (OT) in intergroup conflict is interesting, important, and timely. It is creative and innovative with regards to the paradigm, analyses, and interpretations. In addition to innovation, additional strengths include a large sample size for adequate power, and breadth of analyses performed. We appreciate the positive and enthusiastic evaluation and thoughtful comments from the reviewer. I did notice that some of the most important statistical tests for the conclusions were not significant, but rather statistically trending (Results section) which in my opinion should be noted/discussed as such. We agree with reviewer #2 and now explicitly noted and/or discussed these marginally significant results in the revision. I am curious how the subjects were paid. Was their final payment associated with their performance in the task? The experiment involved no deception, and participants were paid for their presence for the experiment (i.e., $10 show-up fee) plus their average earnings in two randomly selected IADC rounds. This information was clarified in the revision (Materials and methods subsection “Participants”). What is the interpretation of OT increasing the number of non-contributors during attack? We thank the reviewer for this question. There were two potential interpretations for the effect of oxytocin on increasing non-contributors during attack. On the one hand, oxytocin has been linked to prosociality, empathy and consolation (Rilling et al., 2012; Yan et al., 2018; Hurlemann et al., 2010; Bartz et al., 2010; Burkett et al., 2016). This line of research would suggest that oxytocin enhances attackers’ prosocial behavior, including a desire for “peaceful” no-attack (i.e., not contributing). Alternatively, oxytocin has been shown to enhance in-group favoritism and conformity (Aydogan et al., 2017; Stallen et al., 2012; De Dreu and Kret, 2016), to increase behavioral coordination and neural synchronization (Arueti et al., 2013; Mu et al., 2016), and to improve memory and learning from feedback (Striepens et al., 2012; Adam et al., 2008; Ma et al., 2016). This line of research would suggest that oxytocin enables attackers to coordinate better on the level and timing of their attacks, and to efficiently appropriate resources from out-group rivals. Here non-contributions reflect a decision to “not attack now,” for example because the defenders appear strong and tough to win from. As we discuss in the manuscript, if oxytocin enable groups to coordinate on a peaceful “no-attack strategy”, we would expect 1) lower victories in attacker groups given oxytocin than placebo, 2) the oxytocin effect on the number of non-contributing attackers should not differ when attacks succeed or fail, and 3) no effect of oxytocin on tracking rival’s defense history. Results from our further analyses on the success rate (oxytocin did not decrease success rate), non-contributor in successful or failed attacks (oxytocin increased non-contributing attacker only in failed but not in successful attacks), and tracking parameter (oxytocin increases attacker’s tracking of rival’s history, less attack when rivals defended strongly) lend supports for the second interpretation that oxytocin increases effective attack strategy rather than peaceful no-attack strategy. Consistent with previous studies, oxytocin may increase non-contributing attacker through its function in facilitating group-serving bias (De Dreu and Kret, 2016; De Dreu, et al., 2011), promoting social learning and cognitive flexibility (Ma et al., 2016a; Sala, et al., 2011), and increasing salience of social feedback (Shamay-Tsoory, et al., 2016). The data supporting the notion that OT does not increase contributions to attack in general, but rather coordinates attacking at the right moment with the right force is quite compelling, especially being more pronounced in the simultaneous rather than sequential procedure. To make that point explicitly in terms of oxytocin increasing payment (leftovers and spoils) more during the simultaneous procedure, it would be nice to see the analyses pertaining to that broken down by procedure (i.e. simultaneous and sequential separately). We thank the reviewer for this question. First, we would like to clarify that oxytocin enables coordinated attack at the right time with the right force is supported by the result of oxytocin effects on the tracking parameter. Oxytocin increased tracking on rival’s past defense, i.e., attackers given oxytocin attacked especially when defenders appeared more rather than less vulnerable. Then, following the reviewer’s suggestion, we broke down the Treatment x Procedure interaction on tracking parameter α by procedure to show the oxytocin effect on the tracking parameters in simultaneous and sequential decision-making separately. We showed that oxytocin increased attacker’s strategic tracking (i.e., a negative α) on rival’s history when decisions were made simultaneously (oxytocin vs. placebo: -0.30 ± 0.05 vs. -0.042 ± 0.098, t(78) = -2.334; p = 0.022, Cohen’s d = -0.522, 95% CI, -0.482 to -0.038), however, oxytocin decreased strategic tracking when decisions were made sequentially (oxytocin vs. placebo: -0.06 ± 0.05 vs. -0.18 ± 0.04, t(78) = 2.031; p = 0.046, Cohen’s d = 0.454, 95% CI, 0.003 to 0.249). This may reflect the fact that in sequential decision-making, people rely more on each other’s investments to coordinate, than on their rival group’s past behavior. Without debating semantics, which is not my intention, I am also struck by the interpretation that OT is a biological mechanism to converge or "coordinate" contributions between individuals in the attack group (when not sequential). It seems to me that the concept of coordination or convergence is secondary to perhaps a primary role of oxytocin to increase one's own (at an individual level) social intuition and acuity in the assessment of how strong or challenging a defense may be and when and how it would be effective to attack as a result (along the lines of social adaptation). In the simultaneous context, it would be evolutionarily important for each individual to act at maximum efficiency because there is no leader or others to rely on as there is in the sequential procedure. So by OT increasing each individuals' social acuity and using that information to act most adaptively or effectively, as a group they will appear coordinated (acting similarly) in their beneficial action and together will achieve success. In this case, OT would not be facilitating the social coordination per se, but rather individual social acuity and reaction assessment that is necessary to achieve success as a group in the simultaneous context. We thank the reviewer for this observation, and we agree that it is difficult to disentangle whether 1) oxytocin directly increases coordinated attacks or 2) oxytocin primarily increased individual-level performance, which results in seemingly coordinated group behavior. One key argument is that in our economic contest, *individual attackers* are always best off by not investing whatsoever, yet that *attacker groups* are better off attacking (with the right force at the right time). The reviewer’s observation that oxytocin increases social acuity and intuition, combined with our result that oxytocin increases efficient group-level attack, suggests that the oxytocin-enhanced social acuity/intuition is “used” to align individual behavior with those of others within one’s group, thus producing (unintentionally perhaps) enhanced coordination and more efficient collective action. In our revision we toned down any strong statements about the precise mechanisms underlying our observation that oxytocin leads attacker groups to be more efficient. Also, I am not convinced that this study demonstrated that social bonding and performing synchronization rituals helps coordinate attacks (as put forth in paragraph two of the Discussion) because as I understand it, in this study group members did not interact or socially bond before coordinating their attacks. Overall, I was extremely impressed with the caliber of this thought-provoking manuscript and believe that is positively contributes to the field and scientific community. We thank the reviewer for this helpful suggestion. We now toned down allusions to the relationship between coordinated attacks and social bonding, and revised the Discussion accordingly (paragraph two). We maintained references to work showing that attacker groups often engage in social bonding practices, and that social bonding and synchronized action can trigger the release of oxytocin. From these isolated lines of work, we derive the hypothesis that oxytocin may facilitate coordinated attacks. But, per the reviewer’s correct observation, we refrain from suggesting that social bonding increases coordinated attack through enhanced levels of oxytocin. This indeed is too speculative. We thank the reviewer for this observation and now provide the information in the revised figure legend. We appreciate the positive evaluation and helpful suggestions from the reviewer. The reviewer is correct that earlier work (reviewed in De Dreu and Kret, 2016) showed that administering oxytocin increases defensive hostility towards threatening outsiders. We find no evidence for this in the current economic contest, which mimic earlier findings that in the attacker-defender game oxytocin influences investments in attack but not in defense (De Dreu et al., 2015). To appreciate this difference in research findings it is important to note that (a) the finding that oxytocin can enhance defense hostility is obtained in individual, one-shot games where participants do not have a shared history or future, and (b) in re-iterated attacker-defender contests as studied here, defense is tough and heavily anchored on the attacker’s history of play, thus leaving little “room” for increased defense under oxytocin (compared to placebo). Thus, our null-finding for defense may be due to a ceiling effect and/or an overshadowing by attacker history. We have revised the Introduction to clarify the possible differences in setting between earlier studies finding such an oxytocin-enhanced defensiveness, and the current set of results. We thank the reviewer for this enquiry; yet believe that our manuscript did provide the necessary break-downs to appreciate the significant comparisons. To be sure, we performed our ANOVA on 2 (Treatment: Oxytocin vs. Placebo) × 2 (Role: Attack vs. Defense) × 2 (Procedure: Simultaneous vs. Sequential) × 15 (Rounds), which thus fully breaks down possible comparisons. We reported significant effects of main/interaction and provided the means and statistics (Results paragraph three). To accommodate the reviewer, we also analyzed the contributions in a 2 Treatment (Oxytocin vs. Placebo) x2 Role (Defense vs. Attack) ANOVA (thus collapsing across rounds and decision-procedure). This analysis essentially replicates the findings reported in the Main Text: Defenders invested more than attackers (F (1,78) = 287.912, p < 0.001, η2 = 0.787), and individuals contributed somewhat less when given oxytocin than placebo (F(1, 78) = 3.719, p = 0.057, η2 = 0.046; marginal significance). The Role x Treatment interaction was not significant (F<1). For attacker groups, oxytocin decreased contributions (F (1, 78) = 4.367, p = 0.040; η2 = 0.053) compared to placebo. No significant treatment effect was found for defender groups (F (1, 78) = 2.006, p = 0.168, η2 = 0.025). We believe that this 2 x 2 analysis is, however, redundant with the full model shown in the Main Text. Accordingly, we have not incorporated it in the revision at present but are happy to reconsider. We thank the reviewer for pointing this out. Indeed, inconsistent with previous study (De Dreu et al., 2016) showing higher numbers of non-contributors in the simultaneous than sequential block, we did not observe a significant effect of Procedure on non-contributors in the current study. One possibility is that the previous study (De Dreu et al., 2016) used fewer rounds (5 rounds) than the current study (15 rounds). Another possibility is chance (as the patterns of the other indices, including success rate, within-group variance, and contribution, were consistent with previous findings in De Dreu et al., 2016). This possibility is not unlikely, as we did replicate the De Dreu and colleagues’ findings of decision-protocol on non-contributors in an early independent pilot study with Chinese participants. We’re very grateful to the reviewer for this thoughtful suggestion. Following the reviewer’s suggestion, we conducted further analyses and included the results in the revised manuscript (Results paragraph seven). We agree that this helps to better understand attack efficiency. We thus conducted correlation analyses between the tracking parameter α and success rate, and found that α was not correlated with success rate (r = 0.124; p = 0.276). This suggests that the oxytocin-increased attack efficiency was reflected more in terms of increasing group earnings rather than attack success. This is due to that, in the current game, winning is not necessarily associated with more earnings for attackers (r = 0.065; p = 0.565), as when the defenders contributed a lot to defend (e.g., GDefender ≥ 30), attackers would gain less even if they win (attack succeeds but earned leftover + spoil < 20 MU) than deciding to not contribute (attack failed but earned 20 MU). We thank the reviewer for this question. The point that “in-group defense is tacitly well-coordinated because of the stronger alignment of individual interests within defender groups” is based on the rule of attacker and defender in the current game, as detailed in Table 1. Thus, individuals in the defender group share a stronger common fate in that when in-group defense fails, all group members gain 0 regardless of whether they contributed or not. We agree that different cost/benefit ratios and different losing/gaining ratios can alter investment behavior substantially, both for game-theoretic reasons and because of differential psychological mechanisms coming into play. It may be, though here we have to speculate, that changing the “all-or-nothing” pay-off structure for defenders to a “survive well or less well” structure may provide more room for oxytocin to influence contributions to defense. It would be interesting to examine such possibilities in future research. We appreciate the reviewer’s careful reading and apt comments regarding the framing of our work. We have taken it to heart and substantially revised the text to avoid off-hand allusions to the battle-field and to keep our revision stays closer to the data; we thank the reviewer for pointing us towards a less florid and more succinct reporting. We agree that coordination and synchronization occurs at various levels (neural, behavioral) and we have rewritten our manuscript to be more clear what we meant when referring to coordination – behavioral alignment of contributions to the group pool. Our definition and operationalization stays close to the work in experimental economics and games, and we hope this is now clarified. In addition, we now refrain from using the term synchrony (and also no longer reference war dances and oxytocin-induced neural synchronization studies). As noted, we have toned down substantially our reference to these literatures, and we agree that economic contests in which one can end-up victorious over others (and win money), or being defeated by others (and lose one’s money) are hyper-stylized models of attacker-defender conflicts found in real life. Yet at the same time, our work subscribes to a strong line of work, grounded in game-theory and experimental economics, that proceeds on the basis of the assumption that such stylized models of competition and conflict can reveal understanding of the mechanistic underpinnings of strategic choices in conflict situations, including the possible neurohormonal substrates of attack and defense. We wish to note further that participants were never told to ‘attack’ or ‘defend’. All the experimental instructions used neutral language (e.g., contribution was labeled investment; defense and attack were avoided, and groups were labeled to as group A or B). In contrast, the role of ‘attack’ and ‘defender’ is based on the contest functions in the IADC game (as now detailed in Table 1 in the revision). Individuals in the defender group share a stronger common fate in that when in-group defense fails, all group members gain 0 regardless of whether they contributed or not. Only if defense succeeds, individuals in the defender group ‘survive’ from left with 0. In contrast, attackers can always keep their remaining endowment (leftover) and spoils are additionally added into their earnings if attacks succeed. The working assumption is that these different contest success functions for attacker and defender groups elicit distinctly different social, psychological and, therefore, neurobiological operations that may be informative about “real life” intergroup competition and conflict outside the laboratory. For example, attackers are driven by the motivation to maximize gain and defenders are motivated to avoid loss, thus attack and defense would recruit distinct neurobiological systems (Nelson and Trainor, 2007; Yamagishi and Mifune, 2016). Earlier related work, and the current project, aims to uncover these possibilities. We have revised the manuscript to ensure that unwarranted generalizations are avoided. We thank the reviewer for this question. First, we would like to clarify that the ICC was measured for both attacker and defender groups, not only for attacker group (please see Figure 5—figure supplement 1 in the revision). Second, to examine the interesting possibility that the increased ICC was driven by the number of non-contributing attackers, we calculated the correlation between ICC/within-group variance and the number of non-contributing attackers. If the increases in group coordination were driven by the number of non-contributors, we would see significant correlations between ICC/within-group variance and the number of non-contributing attackers. However, neither the ICC nor the within-group variance was correlated with the number of non-contributors (within-group variance: r =-0.073; p=0.517; ICC: r =-0.146, p=0.197). Thus the increased within-group coordination is not simply driven by the increased number of non-contributors. This null-finding is consistent with our observation that coordination does correlate with attack efficiency (i.e., greater spoils when victorious; more left-overs when attacks failed). A more parsimonious explanation for the findings – and one that must be ruled out before offering a mechanistic explanation based on rituals and action coordination – would be that oxytocin increased the participants' memory for the sequence of events (there is evidence for oxytocin effects on memory) or that it reduced their level of stress and increased calmness and lethargy (there evidence in both humans and animals) and they reduced their contributions. We’re grateful to the reviewer for pointing out other possible explanations of the oxytocin effect (such as the effect of oxytocin on memory or mood). If the observed oxytocin effects on the IADC game were driven by its effect on memory or mood, we would expect similar effects of oxytocin on attacker and defender groups, and similar oxytocin effects for simultaneous and sequential blocks. However, the effects of oxytocin on increased coordination, non-contributor and strategic tracking were modulated by Role and/or Procedure. Specifically, if the oxytocin-increased strategic tracking mainly reflected the effect of oxytocin on improving participants’ working memory of one’s own or in-group members’ or rival’s contributions, we would expect a generic effect of oxytocin on the tracking parameter. However, we showed a significant modulation of Procedure on the oxytocin effect on tracking (as oxytocin only increased attacker’s tracking when decisions were made simultaneously rather than sequentially). In addition, no effect of oxytocin was observed in defender groups’ tracking on rival’s history. Regarding the potential explanation of oxytocin effects on reducing stress or increasing calmness, we conducted analysis on the mood changes (please see SI). Participants completed the Positive and Negative Affect Scale (PANAS) upon arrival and after the experiment to quantify their mood changes. PANAS measured both positive and negative mood that related to stress and calmness, such as nervous, distressed, alert, afraid, upset, excited, jittery, active. There was no significant mood change overall and no significant interaction effects with Role or Treatment. We also conducted the paired t-test (before- vs. after-experiment mood) for each group to examine mood change for each group. None of the group showed significant change in positive mood or negative mood (ps > 0.05,Supplementary file 1, Supplementary Tables 1C). Moreover, ANOVAs with Treatment and Role as between-subjects factors on the positive and negative mood changes, as well as overall mood changes, also did not show significant main effects of Treatment and Role, or Treatment x Role interaction (ps > 0.05). Even within the literature on oxytocin and economic games (which should provide the conceptual frame for this study) the findings need to be reconciled with those showing that individuals donate more under oxytocin. Is this a cultural phenomenon specific to the Chinese culture? We thank the reviewer for this question, and accordingly discussed the effects of oxytocin in the current study and in the oxytocin literature. The variable nature of oxytocin effects on prosociality has been increasingly recognized in the oxytocin literature. Oxytocin does not simply and always promote prosociality, it has been implicated in many social behaviors, from promoting trust, generosity and cooperation (Aydogan et al., 2017; Arueti et al., 2013; Yan et al., 2018) to aggravating envy, mistrust and aggressive behavior (Ne'eman et al., 2016; Shamay-Tsoory et al., 2009; Radke et al., 2012). The seemingly contradictory oxytocin effects may be moderated by individual and contextual differences, with group context as one prominent candidate (De Dreu et al., 2010; 2011; Ma et al., 2015; De Dreu and Kret, 2016). The current findings of oxytocin-increased group coordination, non-contributing attacker and tracking on rival’s history were consistent with the oxytocin literature that showed the effect of oxytocin on facilitating group-serving bias (De Dreu and Kret, 2016; De Dreu, et al., 2011; Ma et al., 2015), on increasing behavioral coordination and neural synchronization (Arueti et al., 2013; Mu et al., 2016), on promoting social learning and cognitive flexibility (Ma et al., 2016a; Sala, et al., 2011), and increasing salience of social feedback (Shamay-Tsoory, et al., 2016). In the revision we note and reference these literatures. While we believe we provide a nuanced review, we would be happy to further include references to studies the reviewer believes are critical to cite too. We beg to disagree with the reviewer that between-subjects designs are deviating from the golden standard in oxytocin studies, and believe biases in randomization cannot account for our results. First, we now described the randomization procedure more fully (subsection “Procedure”), emphasizing that participants were measured not only on demographics, but also on current mood and psychological variables. We showed that individuals in the four groups (Attacker/Defender x Oxytocin/Placebo) did not differ in demographic information, mood change, and prosocial-related traits (Supplementary file 1. Supplementary Tables 1A, 1B). Second, several meta-analysis studies have summarized the behavioral (Van IJzendoorn, Bakermans-Kranenburg, 2012; Shahrestani, et al., 2013) and neural (Wang, et al., 2017) effects of oxytocin. For example, in the meta-analysis of oxytocin behavioral effects (van IJzendoorn and Bakermans-Kranenburg, 2012, Table 1), among the 31 studies examining the effects of intranasal oxytocin on face recognition, trust to in-group, and trust to out-group members, 10 studies adopted within-subjects design whereas the majority (i.e., 21 studies) employed between-subjects designs for oxytocin and placebo administration. Shahrestani and colleague summarized 7 studies examining effects of intranasal oxytocin on emotion and face recognition, all of which employed between-subjects design (Shahrestani, et al., 2013). Similarly, we summarized the neural effects of intranasal oxytocin in our recent meta-analysis of oxytocin-fMRI studies published before March 2017 (Wang et al., 2017). There were 50 fMRI studies intranasally administering oxytocin in healthy individuals, of which 29 employed between-subject design (21 studies employed within-subject design, Table S1 in Wang et al., 2017). We believe that between-subject designs is often used and producing reliable and replicable results for the oxytocin/placebo contrast, as we found here too. We hope that our revisions clarify what we did, and what we can conclude from our results. We thank the reviewer, once again, for challenging us to provide a crisper and more factual manuscript. This work was supported by the National Natural Science Foundation of China (Projects 31722026; 31771204; 91632118; 31661143039 to YM); the Fundamental Research Funds for the Central Universities (2016NT05; 2017XTCX04; 2018EYT04 to YM); Beijing Municipal Science and Technology Commission (Z151100003915122 to YM); Open Research Fund of the State Key Laboratory of Cognitive Neuroscience, Beijing Normal University; startup funding from the State Key Laboratory of Cognitive Neuroscience and Learning, IDG/McGovern Institute for Brain Research, Beijing Normal University to YM; and the Spinoza Award from the Netherlands Science Foundation (NWO SPI-57–242 to CKWDD). We thank Shiyi Li for assistant in data collection and the members of the SANP lab at Beijing Normal University, and the members of the social-decision making laboratory at Leiden University for comments on an earlier draft. Human subjects: All participants provided written informed consent to participate after the experimental procedures had been fully explained, and were acknowledged their right to withdraw at any time during the study. All experimental procedures adhered to the standards set by the Declaration of Helsinki and were approved by the Institutional Review Board at the State Key Laboratory of Cognitive Neuroscience and Learning, Beijing Normal University, Beijing, China (protocol number: ICBIR_A_0107_001). © 2019, Zhang et al.